This late-summer to early/mid-fall perennial should be placed in the ground in springtime after all danger of frost has passed or in early autumn. Plants that provide late season sustenance to pollinators, especially Monarchs, are valuable additions to wild areas, and borders too, as they are adaptable to all but dry poor soils. Site at the mid to back border where other plants can hide their late season bare "shins". Pinch back a few times before July to encourage bushiness and control height (keep in mind this will also delay flowering a bit). Cut back after flowering if self-sowing is unwanted, or if the plant foliage is becoming unsightly. Soil pH: This plant can grow in a variety pH levels, but prefers one which is slightly acidic. Fertilizer: Top dress with about a half inch of compost each spring. Diseases & Pests: Prevent powdery mildew by placing in full sun with plenty of airflow; apply an organic fungicide every week or two if needed—also remove any infected leaves. Plant: This plant has an upright habit with stiff, hairy stems adorned with green, hairy lance-shaped leaves up to 4" in length. 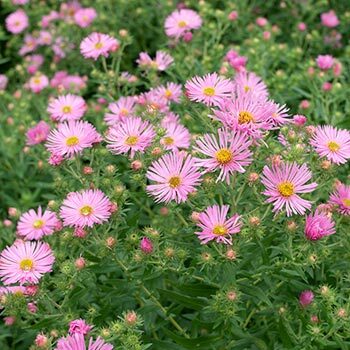 Flowering: Waves of petite daisy-like flowers with lavender pink petals surrounding yellow centers. Seeds: Flowers produce achenes, similar to sunflower seeds. The specific epithet novea-angliae means "of New England, USA."